Hilda Doolittle, who published as H.D., was one of the best-known Modernist poets of the early 20th century. She was born in Pennsylvania in 1886 & moved to London in 1911, where she lived for the rest of her life. She was involved in the Imagist movement, along with Ezra Pound & Richard Aldington, who she married although their marriage broke down during WWI. She was interested in Greek mythology & this poem, Eurydice, reflects that in the story of the woman who married Orpheus. 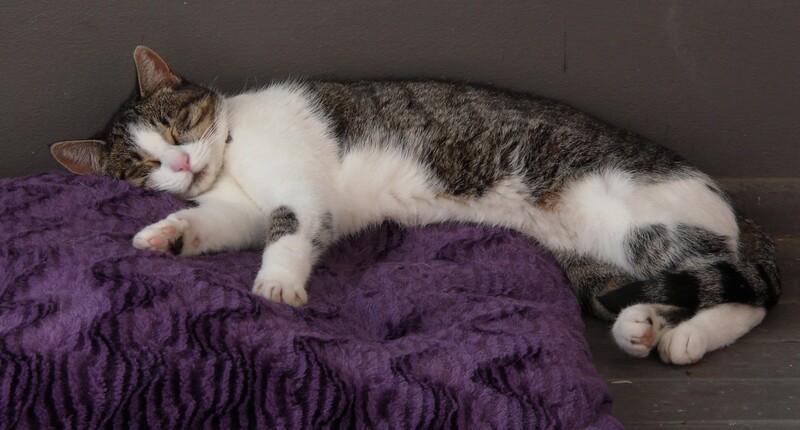 She was pursued by another man, stepped on a snake, was bitten, & died. Orpheus was so distraught that he attempted to bring her back from the Underworld with his music. In one version of the story, Orpheus goes to the Underworld to bring Eurydice back & is allowed to do this as long as he doesn't look at her until they've reached the world again. Doubting that she's really there, Orpheus looks around just before the end of the journey & Eurydice is stranded in the Underworld forever. My anthology only has this first section of the poem. You can read the rest here. But, I loved this big, baggy monster of a book. I'm not sure exactly how baggy it is. I listened to Volume 1 on audio (beautifully read by Greg Wagland from Magpie Audio) & read Volumes 2 & 3 as ebooks as part of the Delphi Classics Dickens, but it must be over 1,000 pages. I bought the illustrated, abridged edition for my library a few years ago & that's 500pp. Forster has always struck me as a bit of a plodder - Watson to Dickens's Holmes - & it's true that his writing is quite pedestrian. He was one of those Victorian literary men who are forgotten today except in their relationships with other famous Victorians. I've always been fascinated to know that John Forster was engaged to the poet, L.E.L. (Letitia Elizabeth Landon). As a woman making a living from her writing, Landon was a controversial figure, who was rumoured to have had affairs & borne children out of wedlock. Forster asked her to refute the rumours & she asked him to investigate for himself. Apparently he was satisfied but she broke off the engagement because she said she couldn't marry a man who distrusted her. Forster strikes me as so cautious & careful that I can't imagine him engaged to Landon in the first place. I believe that Lucasta Miller (author of The Brontë Myth) is writing a biography of Landon & I can't wait to read it. Forster is mainly remembered these days as the friend & first biographer of Dickens. 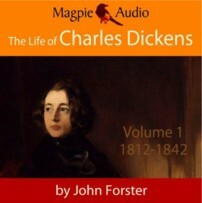 Forster tells the story of Dickens's life - his childhood, family, early attempts at writing, the overnight success of The Pickwick Papers, the growing readership with each new novel, the periodicals he "conducted", his travels to America & Europe & the famous series of readings of his own work that made Dickens even more famous by the end of his life. The writing is genial & painstaking. However, as soon as Dickens makes a personal appearance in his letters or in an anecdote Forster remembers from their long friendship, the narrative fizzes. This is the real attraction of the book for me & makes me keen to read more of Dickens's letters. The letters show what a genius Dickens was. Everything he wrote became a story & some of his letters are as well-shaped as a chapter from the novels. The story of the death of the raven, Grip, is so moving yet so very funny. Magpie Audio chose this section of the book as the audio sample on Audible &, after hearing that, I just had to listen to the whole book. The advantages that Forster brings to the familiar story lie in his intimate acquaintance with Dickens. Forster was not only a friend but a literary adviser, reading the novels in proof as they were written & advising on titles, illustrations & dealings with printers & publishers. He was one of the few people who knew about Dickens's experiences as a child - his father's imprisonment for debt & his own period of humiliation working in the blacking factory. It was in this biography that Dickens's reminiscences of his childhood were revealed for the first time. I found those early chapters very moving, even though I've read the story many times before. Imagine how the first readers would have felt, seeing the inspiration for many of the characters & plots of the novels based so closely on the author's own experiences. The subject of the public readings Dickens gave is one where the two men disagreed quite decisively. Forster was against the readings. He felt that they would not enhance his reputation & the implication is that they were a little beneath him. They were too close to theatre & actors were regarded as socially & morally suspect (Claire Tomalin's book, The Invisible Woman, gives an excellent account of the world of the Victorian theatre & the less than respectable reputation of actors in relation to the Ternan family). Forster also feared that Dickens's health would not be up to the strain - & he was right about that. Dickens was determined to go ahead. He was a showman & loved the theatre, putting on plays with his family & for benefit performances for fellow writers. He loved to be in charge & he conducted his theatrical adventures as he did every other part of his life, with 110% effort & commitment. He was also tempted by the considerable sums of money that managers & entrepreneurs were willing to pay him. I found myself wondering what the first readers & critics made of this. Trollope was derided for seeing his writing as a job, writing so many words every day & being pleased with the money he made, which he described in his Autobiography. Dickens may have loved being on stage but he loved the money he made just as much. Letter after letter to Forster lists the takings from each night's readings, the effect his reading had on the audience (women fainting & having to be taken from the theatre) & the queues of people desperate to get tickets. "Too late to say, put the curb on, and don't rush at hills - the wrong man to say it to. I have now no relief but in action. I am incapable of rest. I am quite confident I should rust, break, and die, if I spared myself. Much better to die, doing. What I am in that way, nature made me first, and my way of life has of late, alas! confirmed.I must accept the drawback - since it is one - with the powers I have; and I must hold upon the tenure prescribed to me." Forster describes the grief of people from all over the world when Dickens died & quotes the letters that he received. He describes his purpose in writing the Life to be to show the man himself, the way his books were conceived & written, using the letters written to him & the recollections of others. He says that he used barely half the letters in his possession & I think I read somewhere that he destroyed all the letters when the book was finished. If only he hadn't burned the letters! One of the many If onlys in literary history (If only we had Emily Brontë's second novel, if only we had Charlotte Brontë's letters to Mary Taylor, if only Dickens himself hadn't had so many bonfires of his correspondence, if only Princess Beatrice hadn't censored Queen Victoria's letters...). Still, there's no use crying over burnt letters & at least we have the hundreds of quotations in this book. I wouldn't recommend Forster's Life as the first book to read about Dickens but it's definitely worth reading if you've read the modern biographies & want a more intimate view of the man. For all the discretion & the obfuscation, Forster's Life is fascinating in the way that Elizabeth Gaskell's Life of Charlotte Brontë is fascinating. The authors knew their subjects & the sense of intimacy & personal knowledge makes up for the evidence suppressed & the curtains drawn over the less attractive aspects of their subject's character. Another fascinating woman I'd never heard of. Leonora Speyer was a poet & violinist (see the gorgeous portrait of her playing the violin by John Singer Sergeant here). Born in Washington in 1872, she studied & played the violin professionally in Europe & won the Pulitzer Prize for Poetry in 1927. This poem, The Ladder, has quite startling imagery of sadness, regret & humiliation. and you, you climbed that ladder of delight. I kissed the foot that bruised me as it passed. 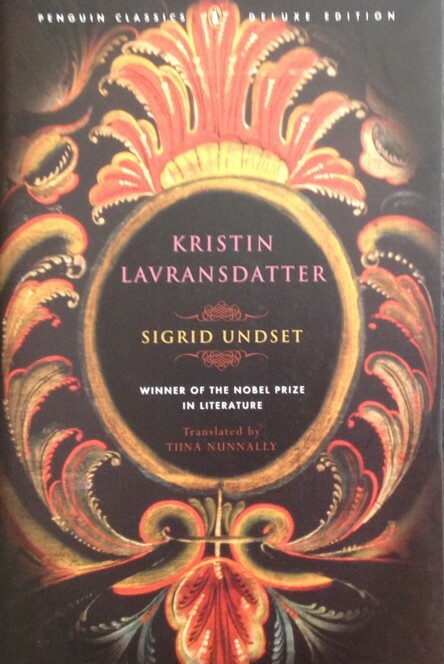 The first part of Kristin Lavransdatter ended with a wedding, but this was not the conventional happy ending of romances & fairy tales. Kristin & Erlend had waited years for this moment & Kristin, especially, had been weighed down by the guilt she felt at transgressing against God's laws as well as deceiving her beloved father. She also realised that she was pregnant & faced the prospect of shaming her parents even more if this became known. Erlend & Kristin travel to his estate at Husaby after the wedding & Kristin begins her new life as a wife & mistress of a great estate. At first, all she can think about is the child that will be born too soon after the wedding. This first section of the book is called The Fruit of Sin. When Erlend finally realises that Kristin is pregnant, he is dismayed but he has never really understood the wrong he did to Kristin in seducing her & encouraging her to carry on their affair. Kristin's labour is horrendous & she barely survives. Her son, Naakkve, is her only consolation. Soon after the birth, she goes on pilgrimage, barefoot & alone except for the baby, to pray at the altar of Christ Church. And here knelt Kristin with the fruit of her sin in her arms. She hugged the child tight - he was as fresh as an apple, pink and white like a rose. He was awake now, and he lay there looking up at her with his clear, sweet eyes. Conceived in sin. Carried under her hard, evil heart. Pulled out of her sin-tainted body, so pure, so healthy, so inexpressibly lovely and fresh and innocent. This undeserved beneficence broke her heart in two; crushed with remorse, she lay there with tears welling up out of her soul like blood from a mortal wound. The pilgrimage soothes Kristin in some ways, & her work at Husaby also helps to relieve her feelings. The estate has been left to run down. Erlend is no farmer & his travels & adventures have left him little time to settle down. Kristin is a good & careful manager & soon gains the respect of the servants & tenants. She has more children - seven sons in all - & her absorption in the children & her lingering sense of grievance over Erlend's past behaviour & thoughtlessness, lead to tensions between them. Erlend's two children from his relationship with Eline are another source of guilt to Kristin. She establishes a good relationship with the boy, Orm, after a rocky start, but Erlend's daughter, Margret, is proud & arrogant. Erlend feels guilty about these children. They're illegitimate & so can't inherit his property. He spoils Margret & is hard on Orm, a frail, gentle boy who will never be a great warrior. He resents Kristin's advice & blames her for supporting Orm & trying to correct Margret. Kristin's brooding on her sins often threatens to dominate her life. The local priest, Sira Eiliv, counsels her to stop worrying about her own sins. She should pray & do good deeds, much more useful than dwelling on the past. Erlend's brother, Gunnulf, is a priest, & Kristin looks to him for help as well. She also realises that Erlend is not respected by his peers & worries about what this will mean for their future. Erlend is impetuous & rash, not a steady man like her father or Simon Andressøn, the man she rejected when she fell in love with Erlend. Simon has stayed on good terms with her parents. He married a rich widow &, after her death, marries Kristen's younger sister, Ramborg. When Kristin & Erlend travel to her childhood home, Jørundgaard, they see how her father relies on Simon as his health fails. The political situation in Norway plays a larger role in this book than in the first. The King, Magnus, succeeded to the throne as a child. His mother, Lady Ingebjørg, ruled as Regent but was forced out by another faction. She remarried & left Norway with her new husband, who was considered below her in rank. Some years later, when Magnus began to rule alone, his mother began plotting with some nobles, including Erlend, to return to Norway with one of her other sons. She hoped to regain control of the country through her younger son. When the plan is discovered - partly through Erlend's thoughtlessness - he is arrested & charged with treason. It's now, when their relationship has been nearly destroyed by old resentments, that Kristin is forced to realise how tightly her life is bound up with Erlend & she turns to her brother-in-law Simon to help them both. He shook hands with his eldest sons and then lifted the smallest ones into his arms, while he asked where Gaute was. "Well, you must give him my greetings, Naakkve. He must have gone off into the woods with his bow the way he usually does. Tell him he can have my English longbow after all - the one I refused to give him last Sunday." Kristin pulled him to her without speaking a word. The she whispered urgently, "When are you coming back, Erlend, my friend?" "When God wills it, my wife." She stepped back, struggling not to break down. Normally he never addressed her in any other way except by using her given name; his last words had shaken her to the heart. Only now did she fully understand what had happened. She sat on the bench along the wall of the empty church. The old smell of cold incense kept her thoughts fixed on images of death and the decay of temporal things. And she didn't have the strength to lift up her soul to catch a glimpse of the land where they were, the place to which all goodness and love and faith had finally been moved and now endured. Each day, when she prayed for the peace of their souls, it seemed to her unfair that she should pray for those that had possessed more peace than she had ever known since she became a grown woman. Sira Eiliv would no doubt say that prayers for the dead were always good - good for oneself, since the other person had already found peace with God. Undset paints a picture of medieval Norway where the pagan past has not quite been banished by the Christian present. There's also a real sense of the loneliness of life in the forests & remote countryside where violence is often the response to unhappiness or a sense of being wronged. Society's laws aren't always respected & the Church struggles to supplant the old gods & the power of the feudal past. I'm looking forward to the last part of the story, The Cross, very much. Adelaide Crapsey was unpublished & unknown in her lifetime. She grew up in Rochester, New York, studied at Vassar College & taught poetry there. She wrote a book on English metrical poetry that was published after her death. She died of tuberculosis in 1914, aged only 36. This poem, The Lonely Death, is beautifully controlled, very spare & quiet, but that final image is powerful. And draw the sheet under my chin. Almost this whole shelf is devoted to Edith Wharton, one of my favourite writers. I spent one summer reading as many of her novels as I could get my hands on & I still have a few more to read. I've probably read more Australian history than I think I have & this two volume history of bushrangers by Charles White was first published in 1900. T H White's Once and Future King is another old favourite. P G Wodehouse & Georgette Heyer are two authors I've only started reading in the last few years. I don't know if I ever would have read them if it hadn't been for the blogs I read & reading groups I belong to. Wodehouse always makes me smile & luckily I have lots more Wodehouse to read. Who Was the Man in the Iron Mask? by Hugh Ross Williamson is a book I read over & over again when I was at school. This copy is a later reprint but I was fascinated by his theories about the Iron Mask, the Casket Letters, the Princes in the Tower & the murder of Amy Robsart. First published in the 1950s, some of the chapters have been superseded by later research (does anyone still think Mark Smeaton was the father of Elizabeth I? ), but I loved this book & it sent me off on many reading trails. Michael Wood is another favourite historian. I had only read his book In Search of the Dark Ages until very recently when the series was finally released on DVD. Made in 1979-81, the 8 documentaries about Boudicca, Alfred, Athelstan etc are wonderful. I don't like the music (very much of its time, too much synthesizer) although at times it's very atmospheric but MW himself has never been better. His enthusiasm as he traces the boundaries of an Anglo-Saxon estate or looks at coinage from the time of Ethelred is great & that sheepskin coat is very stylish. Virginia Woolf takes up the rest of this shelf. 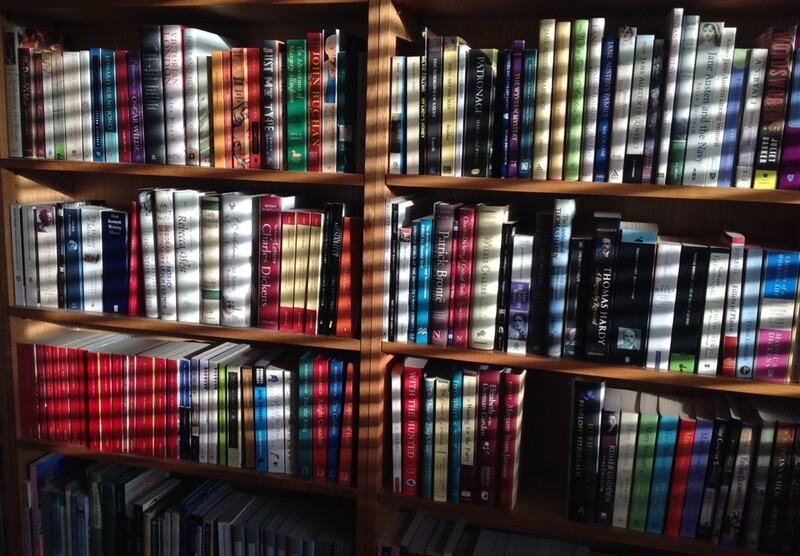 I always want to like her fiction more than I do but I am a fan of the letters (see next shelf), diaries & essays. I rescued the Woolf letters from a library booksale. 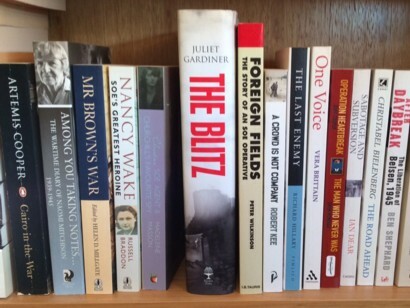 I've shelved WWI & WWII stories & poetry here. I think I only kept John Wyndham's Day of the Triffids because it's the TV tie-in edition with John Duttine on the cover. I loved Charlotte M Yonge's Daisy Chain, but have yet to read any more of her books. Delphi Classics are releasing the Complete Yonge in their next series of ebook compilations so I really will have no excuse then. Finally, Zola - & a wooden chook. There is no connection between Zola & chickens (that i know of) but I'm leaving space on the shelves for the tbr books & I found I had quite a bit of room at the end. The Zola titles aren't very clear. They're Pot Luck, The Ladies' Paradise, Germinal, The Kill & L'Assommoir. Lots more Zola on the tbr shelves so I needed to leave some room. Well, that's it, the tour of my bookshelves. Don't forget to click on the photos to make them larger. 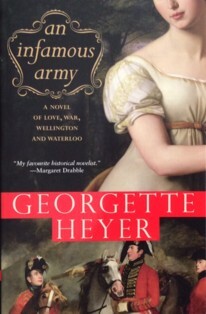 In honour of the 200th anniversary of the battle of Waterloo, I decided to read Georgette Heyer's An Infamous Army, a novel that combines her usual sparkling romance & social comedy with a detailed account of the climactic battle of the Napoleonic Wars. The scene is Brussels in the summer of 1815. A group of English army officers & their families have taken houses in Brussels as the army under the Duke of Wellington faces the prospect of Napoleon's re-emergence on the political scene after his escape from Elba. Napoleon has been gathering troops & acclaim on a triumphant journey through France & the allies - English, Prussian & Belgian - are readying themselves for his next move. Judith, Lady Worth & her husband, Julian are the centre of a small circle that includes the Duchess of Richmond's daughters, Lady Worth's young brother, Peregrine & his wife, Harriet, & Lady Worth's protégée Lucy Devenish, an heiress with middle-class connections. Judith thinks that Lucy would be a perfect wife for Lord Worth's brother, Colonel Charles Audley, an aide-de-camp to Wellington. However, when Charles arrives from Vienna, in advance of Wellington's arrival from talks with the Allies, he is immediately smitten with the notorious young widow, Lady Barbara Childe. Barbara is still only in her 20s but was married off to an older man by her relations. Fortunately she was soon widowed & she has vowed never to be trapped by marriage again. She & her brothers, George & Harry, had been brought up by their reckless father & all three have a streak of wildness. Barbara's beauty & wit have inspired a string of admirers but, when she meets Charles at a ball, & he proposes marriage almost straight away, she's intrigued in spite of herself. Barbara's other chief suitor is Etienne, Comte de Lavisse, suave, confident & very sure of his own appeal. Barbara's sister, Lady Vidal, favours the match because Lavisse is rich & Barbara has no money at all. Charles, with only his salary, is not a suitable prospect in her point of view but Barbara, who thinks nothing of scandalizing society by painting her toenails to match her gown & riding alone in the early morning, is headstrong enough to ignore her sister's advice. Charles & Barbara become engaged, much to the consternation of both their families. However, Barbara seems determined to sabotage her relationship with Charles by continuing her rackety lifestyle. The last straw is when she entices Peregrine away from his wife because Harriet snubbed her. The engagement is broken & the situation is still not resolved when Napoleon's army crosses the Belgian border & the allied army marches towards Waterloo for the final confrontation. I was a little daunted when I read that this book had been used in courses on Napoleonic history at Sandhurst. There's certainly a very detailed description of Waterloo & I think it is possibly too long & too detailed. However, I was listening to the audio book read by Clare Higgins & I did find it interesting. If I'd been reading the book, I may have skipped a few pages. Heyer lets us see several characters - Charles, George, Harry, Lavisse - during the battle which kept me interested. The portrait of Wellington is also very well-done. His loyalty to his staff, his family as he calls them; his frustrations with the politicians & army chiefs in London & with his allies in Brussels; his ability to flirt & attend parties in the midst of his preparations for war & his very moving anguish after the battle as he surveys the scene & comes to terms with the many lives lost. Charles is a true Heyer hero, kind, gallant, loyal, steadfast. Barbara wouldn't be my idea of a friend but Heyer makes her understandable by showing how her background & unfortunate early life have shaped her present behaviour. The most moving scenes in the book are when Barbara & Judith help to look after the wounded men returning from the battle of Quatre Bras, the day before Waterloo. Like any description of war, these scenes reinforce the real cost of battle to the men who have to engage in it. Judith comes to respect & admire Barbara & realises that she has many good qualities that have been hidden under her pose of flippant disregard for the conventions. An Infamous Army is an absorbing novel, one of my favourite Heyers - although I tend to think every Heyer I read is my favourite, until I read the next. I knew that the lines inscribed on the base of the Statue of Liberty were written by Lazarus, but I didn't know the story of the sonnet until I found it again in this anthology & did some googling. Lazarus wrote the poem, The New Colossus, as a donation to an auction raising money to construct the pedestal for the statue. It was then forgotten & wasn't mentioned when the Statue of Liberty was unveiled (or whatever you do with a statue that size) in 1886. Lazarus died the next year, & it wasn't until 1901 that her friend, Georgina Schuyler, began lobbying for her words to be inscribed on the base of the statue. This was done in 1903. It's appropriate that Lazarus's poem has become so famous as a representation of the immigrant experience. She first connected with her Jewish heritage when she heard of the Russian pogroms in the 1880s & became an ardent Zionist. Many later immigrants from Russia & all over Europe would have seen the Statue of Liberty as they entered the United States & become familiar with her words. Lots of Virago Elizabeth Taylors & Josephine Tey. I read most of the Teys as a teenager so I don't own many of them. To own three copies of The Daughter of Time is completely normal. 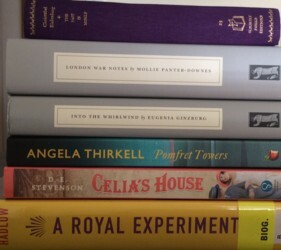 I have the Virago edition of Taylor's short stories on the tbr shelves & lots of Angela Thirkell. 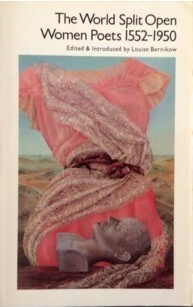 I picked up the omnibus Thirkell secondhand years ago but have only read one of the novels in it. & take up the whole of the next shelf. He did write a lot of books & many of them are very big books. Another Trollope, Joanna this time. I think The Rector's Wife is still my favourite. 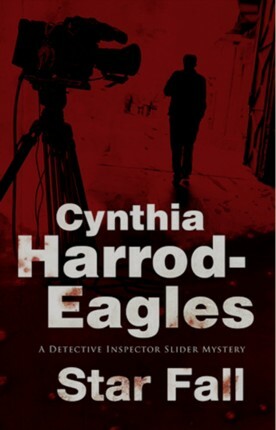 It was the first of hers I read (back in my Ringwood Library days, again). 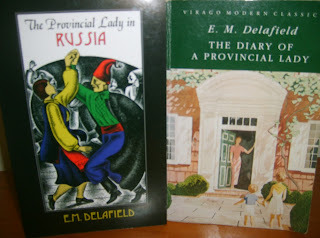 I loved her early books best, as you can see by the fact that I not only bought them but kept them. Jenny Uglow is another favourite. I have her latest book, In These Times, about Britain during the Napoleonic Wars, reserved at work. The Louis Untermeyer poetry anthology is a favourite from childhood. It was where I first read many of the poems that I still remember. I first came across Alison Uttley's Traveller in Time through the TV series with Sophie Thompson & Simon Gipps-Kent. I loved the whole time travel idea & anything about the Queen of Scots was just wonderful. I didn't read the book until years later. Letters to Vicky, the correspondence between Queen Victoria & her daughter, the Empress of Germany was one of those completely immersive reading experiences. I'd have read for hours at a time if the book hadn't been so heavy (& if I hadn't had a cat on my lap). More Viragos here - the terrific anthologies of ghost stories & Elizabeth Von Arnim (I still have lots more of her books to read as well). Marina Warner's books on Joan of Arc, Queen Victoria & the Virgin Mary. Sylvia Townsend Warner's novels are all so different, Lolly Willowes is still my favourite. Retha Warnicke's books on Anne Boleyn & Anne of Cleves, C V Wedgwood's books about the Civil War & Alison Weir. I think I've read all her books & I'm looking forward to her next biography, of Margaret Douglas, which is out later this year. 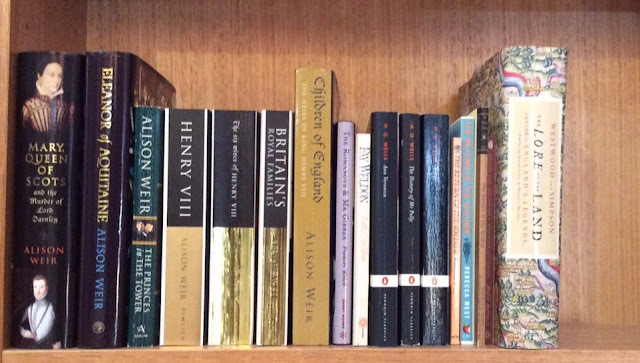 The rest of Alison Weir, H G Wells & three copies of Rebecca West's The Return of the Soldier. One of my favourite WWI novels & the movie (with Alan Bates, Ann-Margret, Glenda Jackson & Julie Christie) is also very good. If you do watch the movie, there are also tiny bit parts by Kevin Whately & Pauline Quirke, both actors much better known now than they were back in 1982. In both scenes, it's the actors' very distinctive voices that are recognizable. The Lore of the Land is here because it didn't fit on the shelf where it should be shelved. Don't forget to click on the photos to see the whole shelf. Next week, Wharton to Zola - the end! I thought I'd celebrate by choosing one post from every hundred that I've written over the past 5 1/2 years. Thank you to everyone who visits & comments or just visits & lurks. It's lovely to know there are so many other people in the world who enjoy the books, poetry & cats I love & want to have a conversation about them. 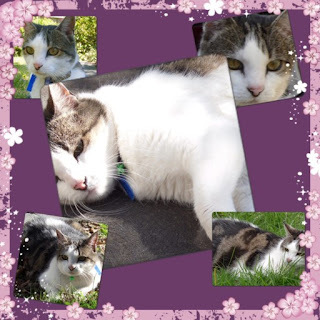 Abby, hot cross buns & reading progress - a post about Abby, who died just over four years ago, but who made her presence felt on the blog in that first year. Also, baking & the books I was reading that Easter. Judging a book by its cover - Sometimes the posts that generate the most comments aren't reviews but general ramblings about books & reading. This post looked at some of my favourite imprints & the changes over the years to the cover art & the way the books are made - font, paper & binding. I also wrote that I didn't see that I would ever want an e-reader. Oh well, it just proves I'm not ashamed to change my mind as I now have a Sony, Kindle & several apps on my iPad devoted to e-books. Memoirs of a Highland Lady - Elizabeth Grant - I know that Blogger's statistics can be a little dodgy but I'm always fascinated by the posts that are in my Top 5 in my stats overview & also by the posts that have generated lots of hits. Sometimes I can guess that it's because the book is on a school syllabus but sometimes I have no idea. This post has had over 2000 hits since January 2011 & I have no idea why. Introducing Lucky & Phoebe - First impressions (without pride or prejudice) of the girls when they came to live with me nearly four years ago. 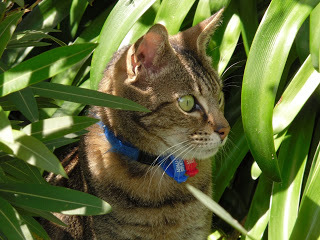 Nothing has changed - Lucky is still timid & Phoebe is still adventurous. Gaudy Night - Dorothy L Sayers - I love rereading my favourite books & I enjoyed writing this post which is more an appreciation of DLS than a review of the book. Sunday Poetry - Sir Walter Scott - Sunday Poetry was one of my better ideas. I hadn't read much poetry for years until I thought about posting a poem each week. It's taken me back to old favourites & to anthologies on my shelves. This post about Scott's Lochinvar took me from the anthology I was reading then to a book I've had since I was a child. Scott, Scotland & a little nostalgia. Plotting for Grown-ups - Sue Hepworth - I've been very lucky to receive review copies from authors & publishers over the years. Sue sent me a copy of her novel, But I Told You Last Year That I Loved You, & I then read & loved her other books. I'm always fascinated by how writers write & authors like Sue & Linda Gillard have discovered that publishing their work themselves gives them a lot more control over the finished book. New arrivals - Buying books is one of my favourite hobbies & posts about my latest purchases & preorders always create lots of comment. I once mentioned to my online reading group that I counted my preorders (like sheep) when I couldn't get to sleep, which caused much hilarity but also made a lot of sense to several members of the group... I just tell myself that I'm building up a good stock of books for my retirement. The joy & the curse of the tbr shelves - I do a lot of dithering in my life & sometimes I dither on the blog as well. Usually it's a not-too-serious complaint about being unable to decide what to read next because I have too many choices & want to read everything at once. Since I discovered podcasts the problem has only increased. When I think that once, all I had to worry about was the review pages in the Saturday paper & the books I saw at work. Now, there are so many wonderful blogs that I read, three online reading groups constantly mentioning books I either know, own & haven't read, or (even worse), have never heard of but must own as soon as possible, plus podcasts that I can listen to while I'm driving, ironing or cooking - no wonder I buy a lot of books! Bookish ramblings - which could be the alternate name for this blog. Julia Ward Howe is best known, maybe only known these days for The Battle Hymn of the Republic. Once you start reading the words, you can't help but start singing. Ward Howe was very active, during her long life (1819-1910), in the movements for world peace & women's suffrage. This is one of her feminist poems, Furthermore. The dignity of suffering, that is ours. Brought back the bitter childbirth throes again. Ye think it grace to yield the meanest part. But we shall love you in our own despite. But where ye pay your due, we yield our all. Say not, ye are shamed in her, but glorified.